JMP Services is a licensed carrier of Controlled Waste under a licence issued by the Environment Agency. This is a three yearly licence, subject to annual review, that permits JMP to carry waste contained on the Hazardous Waste Register (HWR), which is published by the Environment Agency. Hazardous waste includes asbestos and asbestos containing materials. Asbestos is a toxic and dangerous waste and must be disposed of properly; incorrect disposal is illegal and may result in prosecution. JMP Services can help businesses producing hazardous waste fulfil their “duty of care” by ensuring the waste is disposed of properly. Private individuals should never find themselves in a position where they have asbestos waste to dispose of. 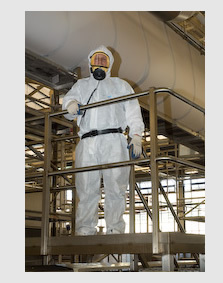 JMP ensure that asbestos waste is disposed of correctly. The material is put into red bags indicating that it is a hazardous material, and then it is into clear bags. The vehicle used to transport the asbestos must be sealed and used exclusively for the transportation of hazardous waste. The asbestos is taken to a landfill site licensed by the Environment Agency for the disposal of hazardous waste. JMP issue their customers with a consignment note as proof that their asbestos will be disposed of properly. For waste consignments over 200 kilos JMP will register the collection address as a producer of hazardous waste on line with the Environment Agency and issue an appropriate Environment Agency consignment note. For waste consignments under 200 kilos JMP will issue an Environment Agency consignment note detailing that the hazardous waste has been disposed of as part of a multi collection round. Peace of mind that JMP Services are licensed waste carriers and collectors so your waste will be disposed of correctly and legally. A cost effective service with prices based upon the quantity of asbestos actually collected. The security that the company you have chosen to dispose of your hazardous waste understands the long term impact that asbestos can have on the environment if it is handled inappropriately. A regular, reliable asbestos collection service if required. Quotes can normally be given over the phone or via email or for larger quantities of hazardous waste site visits can be made for a fuller assessment.